I have two briards Tiff 9yr old fawn and Asti 5yr old black. Welcome welcome to you and your wonderful Briards - what charachters! Brilliant English too... far far better than my dutch! Can't wait to learn more about you and your lovely dogs! Welcome this site does what it says it's really friendly and we're all Briard potty. I only have one Briard called Roxy and she's nearly six and still barmy. Your dogs all look lovely, and thank you for the pics. Wow what a beautiful 'Posse' of Briards you have. Your pictures are wonderful and yes, by your description just typical and true to breed. Prettige kerstdagen en een gelukkig nieuw jaar. Well thats the best I can do. All of your briards are lovely. Have to say your big boy BamBam is the spit of my Gillan so by default is also similar to Carolines stunning Mr Bo Jangles. There are a few Dutch speakers on this site so no worries if you dont know the correct English because someone can always translate for you. Hoping to see lots of pictures from you and what happens in the Zeeland area of Holland. Hmmm Cherie, Lola and BamBam . hahaha, Cherie is French for sweetheart. Lola her name comes from the song from The Kinks (search for that, its a wonderfull song) and BamBam is the right one! The little fellar on the right of the picture is BamBam, its from 'The Flintstones'. When BamBam in the comic doesn't like what happens he goes BamBamBamBam with his bat!! I was there when BamBam was born and the first thing he did when he came out of his mom was banging his head, thats why he is called BamBam. @Everybody: thank you very mutch for the warm welcome and I'm glad that you can understand my typing! The last thing I am is a shark hahaha. Maybe its easyer that you all call me Jacky? That's the English version of Sjaakje. 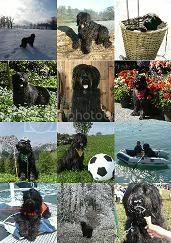 New to the site and I am new to Briards, although my partner Elaine had Briards many years ago in Italy on her farm. Thanks to Debs from Debsbrie Briards and Dexter, Della for allowing us to be a carer of their new puppy Sally. So the world off Briards is new to us and the FBC was a wonderful source when making up our minds. We lost both our dogs this year, Emma a collie cross and Max a whippet, both rescue dogs, from old age, they where 14 years old. At the time we said no more dogs, the emotion surrounding their passing away was just to much. Now several months later we have a Briard - Sally our comedy puppy - after the house just felt so empty. Sally is pretty - naturally - and she is always hanging around for cuddles and always at your feet and she is growing sooooo fast even after just a week. Welcome welcome Sally, Trevor & Elaine to the crazy world of briards and their owners. Love the photos on Sallys web site. Welcome to the FBC! It is nice to see how little Sally has landed on all 4 paws and that she already owns her own website! Look forward to seeing more about how little Sally grows up and do take lots of photos! They do grow up so quickly!! Thanks Paul & Caitriona - Angelique, John, Tiff & Asti for the welcome to the FBC and the world of Briards. The camera is always at the ready and we swear Sally has doubled in size since she came home. Nice to see all the pics. i just have one briard. must be a handfull. 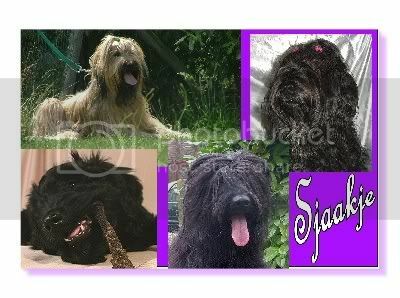 Welcome to the abnormal site Sjaakje and Uncle T. great pics.bam bam looks a great briard... just 1 question...why uncle T and not MR T? I just love your website - but then I would wouldn't I !! Welcome to the FBC - lots of members and lots of knowledge on here! Give Sally a big kiss on the nose from us all. Again thanks for the warm welcome. Debs, Sally gets a big kiss. A warm welcome to both Uncle T and Sjaakje - wonderful photos and updates on your briard families - look forward to learning some Dutch! Nice to have a few more members in FBC hope to hear a lot more from you both. look forward to learning some Dutch! What do you like to lern? It isn't so difficult, hahaha. Help! I'm new to this way of communicating. I'll ask our sons for help soon but meanwhile this is just to say 'hi' and we are the family who had a tragedy last summer (which I wrote about in the Double Dew Claw for those who read that) when our adored two year old Briard, Bertie, died after chasing a sheep over a cliff. We, as in me, my husband and three teenage sons, our Pug dog, cat and three very tame chickens, were joined by Brion in February. Brion comes from the Gilcoru kennel, a four year old male fawn Briard. He is already a well established and much valued member of the family. I have a pic ready to post - of him and Cino, the Pug, staring out at me from the back of our car, into which they had jumped and from which they were refusing to budge without a walk. We live near Epsom and would love to hear from anyone who we could meet for a walk and a play for the dogs. Amanda again, with Brion. Honesty compels me to admit when asking for Briard playmates for Brion that walks with Brion are on the exciting end of the scale at the moment. Having been kennelled until he was nearly four, he is a bit like a boy in a sweetshop with limitless money at the moment. We're practising loads of 'wait's and recalls and, at the recommendation of my obedience class trainer, I am currently using a ten foot rope to help the 'wait's. The thing is that he very passionately wants furry playmates and has very good eyesight and will gallop off onto the horizon if he spots one before me. Otherwise he is St Brion. He is the star of the obedience class and he and I are regularly called upon to demonstrate his brilliant 'wait's, down stays, up sits etc, plus quite brilliant heelwork, I am told. At home he is a model. He ignores the chickens, gets on with our Pug, is known locally by our neighbours as 'the quiet one' (Bertie was less so with strong views about his boundaries! ), greets visitors in a composed and friendly manner, is most attached to me (O discerning dog), loves being groomed. . . But walking near other dogs is something else! Hi Amanda, and welcome to the site. So sorry to hear of your tragedy last summer - it must have been heartbreaking to lose your boy so young and in such a way. Glad to hear that Brion seems to be keeping you fully occupied now, though. Another Briard had occurred to me as the solution to Brion's longing for furry friends. We got another Briard because my husband and boys kept begging. I was less sure since I now work during term time and Bertie was a big handful as a teenager, when I didn't work more than a few hours per day, though just settling into a fantastic intelligent, bossy but manageably so, dog when he died. That's why we looked for a mature dog this time round. However I think the husband might take a little convincing that we need two hairy monsters around the place. (And the cost of kennels - we've just booked Brion in for 3 weeks when we can't take him with us in the summer). Also Brion wagged his tail so much when he first came to us that he opened up a cut, and our kitchen came to resemble an abbatoir! Fortunately that has now healed and we have got skilled at hurrying him outside for major tail wagging sessions when we come back into the house after an absence! But our house is quite small and three 6 foot plus sons, 3 chickens clucking around the garden and tapping on the windowsills, one vocal Pug, one cuddly cat plus Brion might be our limit! Thanks for the suggestion, though! Welcome, Amanda! It's a pleasure to meet you! So sorry to hear about your tragic loss. It's wonderful that you could give Brion a home. I bet he can't believe his luck! Have you thought about coming to the Winnie-the-Pooh briard-a-thon? My two-year-old, Ivy, will be there and she is very good at playing with other doggies! Hello Amanda and welcome! We're sooo sorry to hear about Bertie. I wish we were close by so Nero could play with Brion, but we'll be at the SE briard-a-thon - I hope we can all meet there! I'd noticed the Winnie the Pooh Briathon and would have loved to come. We love Ashdown Forest. Sadly we'll be on holiday in France on that date, but will definitely come to another if possible. welcome to the site can't help with the pics but others will advise. Roxy's a great name for a briard.